New Kids On The Block. Boyz II Men. 98 Degrees. I have very little memory of 98 Degrees, outside of their General Hospital appearances. (Does anyone else remember those special episodes?) But New Kids on the Block and Boyz II Men were my favorites. 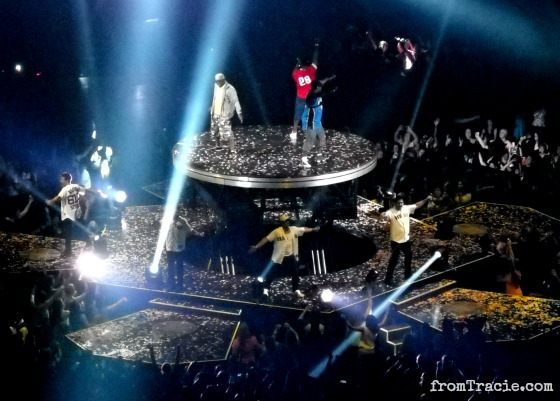 Lee and I went to the NKOTBSB tour two years ago, when Boyz II Men made a surprise appearance (it was amazing - I did not have my camera with me, for which I will always kick myself), so this felt like a bit of a reunion to us. During the concert they talked about how that night inspired this tour. I did bring my camera this time, and I have two pictures for you. I have to share this one, because it was such a great moment - Boyz II Men are on the middle stage, with New Kids On The Block on the stage below them. A 90's dream come true. Yeah. My weekend pretty much rocked. What was your favorite band from your childhood/teen years? Great photos! The concert was simply AMAZING! I touched Joey's hand and caught a rose from Boyz II Men, so I'm pretty much STILL on cloud 9!! Thanks! I saw a couple of yours on facebook, and they looked amazing (you were much closer than me). I'm totally jealous about that rose. When they started handing them out, Lee and I looked at each other and said, "I hope Jessica gets one!" 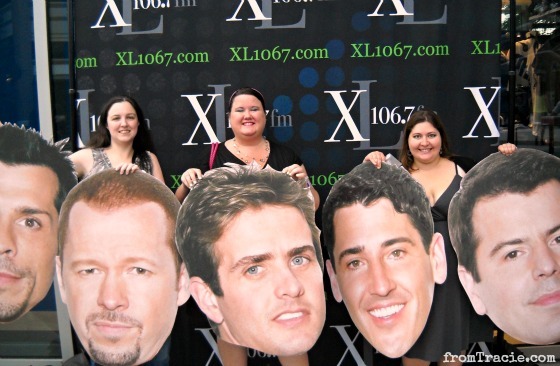 Oh and NKOTB was my fav band growing up (sorry neglected to put that in my first comment)! 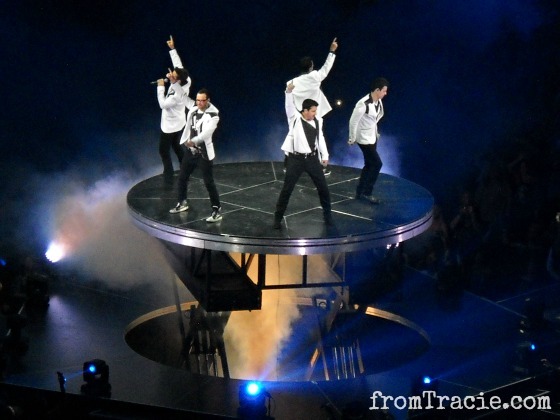 This was my first NKOTB concert and it was sooooooooo amazing! SOOOOOOOO amazing! I'm glad you got to go! ahhh...brings back memories. i was an NKOTB fan as a kid :). step by step, ooh baby! gonna get to you giiirrrrlll. Yes!! It was great to see them do my old favorites. I took a video of them doing Step By Step! Ha! I'm taking it you were not a fan. I'm so sorry you missed it!! The tickets were crazy expensive. I was blessed to have a free ticket, otherwise I wouldn't have been able to do it, either. I was never a NKOTN fan, but I can appreciate the fact that they are from Boston. I did enjoy Boys II Men! Looks like a fun time! All the NKOTB guys are wearing Boston jerseys in that last picture. omg, I DIE. I'm watching the GH episode right now, and I honestly had forgotten. TOO funny. I loved that Emily! They all look like babies!!! I loved that Emily, too!! In fact, I loved all those teens. Those were the glory years of GH, and the time period when I really watched it regularly. Pulling up those old clips made it all come back to me. p.s. The GH peeps look like babies, but so does Nick Lachey!! HEE!! Right? He is all grown up now. LOL! OMG, I am such a huge fan of Boyz II Men! I also remember 98 Degrees as well. You had an amazing weekend! Boyz II Men were my favorite for years. So good. This looks like a blast. I love seeing bands that I was into when I was younger. My big fave from my tween/teeny bop years was Duran Duran. Oh, my heart - were they were in my world. I am actually blogging about them next week so it was great to read this today! OH Duran Duran. They are classic. I love that you are planning to blog about them next week. I can't wait to read it. How fun! Sounds like a wonderful time! I never went to concerts when I was a kid or teen, so it is great these old bands are getting back together and touring again. OMG - I didn't recognize their heads. I still picture Joey as a little kid. He's a MAN now! I loved Boyz II Men best. Man, they were good. All of their songs were hit-worthy. 8th grade dances will never be the same. Right!?! They are all grown up. Every single Boyz II Men song was a big deal. Every.Single.One. Oh 8th grade dances. The stories. The memories. Ahhhh. Maybe they will do something again next year?! Great photos! This rocks! Boys II Men AND NKOTB?? That sounds like an awesome weekend girl. So glad you shared this. I wanted to go to this concert sooooo badly! Jealous! Sounds like an AWESOME weekend for you and the ladies! How lucky you are! Great photos, thank you for sharing. Wow, great photo. You must be at a strategic seat, the photos look great. Oh my, how I missed the 90's! Boyz 2 Men, 98 Degrees.. You're so lucky. Thanks for sharing this pictures.